For the seventh year in a row, Washington, D.C.’s spring marathon champion was a college athlete who competed for something other than a track team. For the first time, though, it wasn’t former lacrosse player Michael Wardian. [button-red url=”http://running.competitor.com/cgiresults?eId=54″ target=”_self” position=”left”] Results [/button-red]Peter Lawrence came to Washington with his family for a spring break trip requested by his daughter.After 20 hours of driving, with stops in New Orleans, Atlanta, the now-41-year-old, who played tennis at the Virginia Military Institute hit town for a week of sightseeing with a cadre of elementary school-age children. It just so happened that the Rock ‘n’ Roll Marathon was taking place while he was in town. He spent most of the race running alongside Wardian, of Arlington, who spent more than six months dealing with multiple stress fractures that disrupted his prolific long-distance racing schedule. “I figured Michael knew the course, so he was the right guy to run with,” Lawrence said. Apparently not, because course revisions in Southwest Washington and a confused bicycle guide led the duo astray in mile 16, adding approximately 30 seconds to their times. Wardian’s experience ended up serving neither of them, and for a while it seemed it only enlarged their gap behind frontrunner Jordan McDougal, who held more than a two-minute margin at 18 miles. “It hurt my PR a little bit,” Lawrence said, noting his 2:32:27 today was almost 2:30 better than his Houston Marathon finish Jan. 13, itself a dramatic improvement over the same race last year, when he ran 2:42:09. McDougal’s lead shrunk in mile 19 after his stomach got the better of him and he called it a day, not bad work for a guy who decided less than a week ago to give the race a shot. By then, Lawrence had broken away from Wardian and was on his way to checking off “win a marathon” on his bucket list. He got a boost seeing his wife, son, daughter, niece and nephew in mile 18, where things started to happen for him and he saw himself realize a dream he didn’t imagine having a few years ago. He wouldn’t quite get the sub-2:30 he wanted, but he’s not complaining. In Houston, Lawrence trains with the Bay Area Running Club. He’ll be back there less than two days after breaking the tape at RFK Stadium. Meanwhile, Wardian didn’t seem to mind trailing by almost two minutes. For his fourth run longer than 14 miles since he started running again in late January, he was surprised to have run so fast. Though he won the Lower Potomac River Marathon six days before in 2:42:31, it was not without its complications. He’s running about a third of his normal mileage, but after staring into a huge chunk of his calendar unable to run at all, just being out there is a gift. Third place finisher Eric Senseman, of Madison, Wisc. 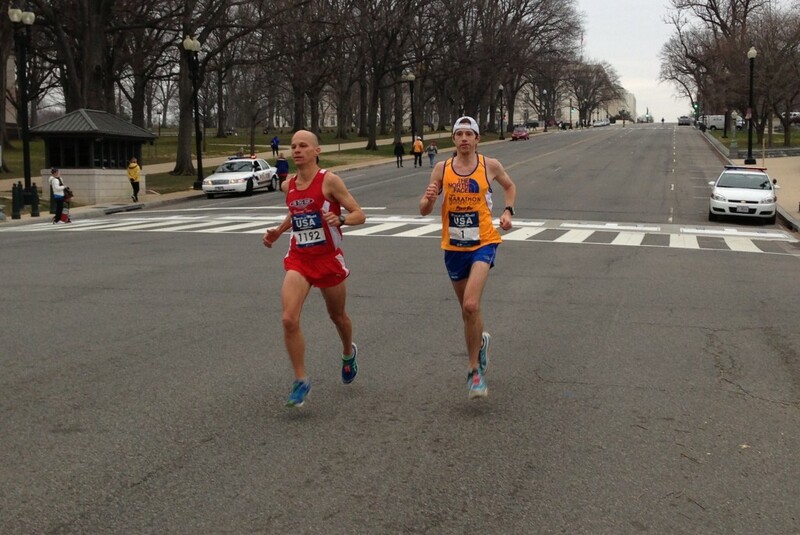 didn’t mind feeling greedy as he moved his way through the top six when the half marathoners peeled off. He was racing in Washington for the first time, though he’ll be returning in June for the North Face Endurance Challenge. The men’s half marathon came down to a dramatic move made on the hill leading off of the Rock Creek Parkway to Calvert Street. Ethiopian Tumicha Horsa put a move on Falls Church’s Chris Mills that Mills couldn’t cover. Horsa, through an interpreter, said he wasn’t familiar with the course, so he gauged his move on how the race was going with Mills and when he saw the hill, he took his shot. “When I got to mile 12, I pushed,” he said, via the interpreter. Horsa ended up in 1:06:44, with Mills behind in 1:07:03 and George Mason University alumnus John Holt in third in 1:08:20.